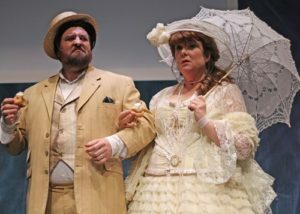 Sondheim’s vocally challenging piece, with book by James Lapine, creates the story behind the Seurat masterpiece, with a splendid casting from director Tiffany Coville-Schweigert and musical direction of Betsy Bledsoe. 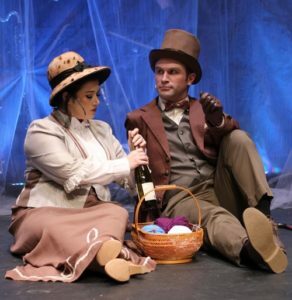 Musically, “Sunday in the Park with George,” probably Sondheim’s most challenging piece features a musical score that gives no hint of the melody and the vocalists need to be spot on, because pitch and melody do not assist them in any fashion. The OCTA orchestration expertly provides the score for the talented vocalists to perform for the audience. The combination is tricky and powerful. For this show to work, a strong cast and solid orchestra need to merge–and it does with this production. 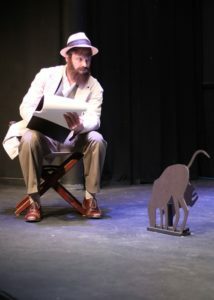 Joel Morrison gives his best lead actor performance in a show that needs a strong George to carry the action and unite the two acts. Morrison is charming as the self-centered, drive-driven perfectionist of the artist. Morrison is harsh, charming, abrasive, reclusive, funny, and almost everything in between, except loving, sentimental, caring. He’s got his own dream and sees only the colors of the world of art. 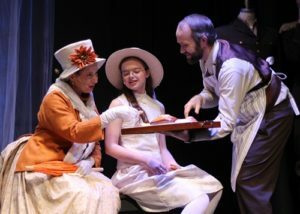 Matching George, his love-interest, Dot, allows herself to love George and accept his attitude in hopes of breaking though to find a place in his heart. Dot’s devotion proves that love given freely and fully does not always return as anticipated. 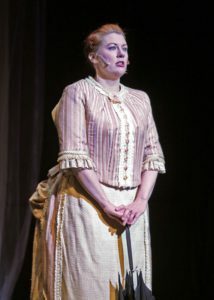 Victoria Strafuss, fairly new to the KC Metro stages, gives a tender yet strong Dot character to counter-balance Morrison’s abrasive George. Morrison and Strafuss are the crux of the show and carry it well. Vocally, they are superior. Acting wise, Morrison pulls off a flexible, loose George while Strafuss balances with a stiffer, more dominant characterization of Dot. George represents the creative, flexible mind set. Dot represents the reality of life and pain of unfulfilled dreams. Beautiful chemistry between them makes the show touching. Elaine – Christina Casey, Celeste #2 / A Photographer – Nancy Seeman, Louise – Abby Morrison. Violin 2 – Emily Gooden, Kim Ico, Cello – Kieran Ojakangas. 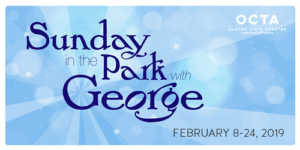 “Sunday in the Park with George” continues weekends through Feb. 24. Tickets can be purchased online at the OCTA website, by phone, or in person at the box office prior to the show. 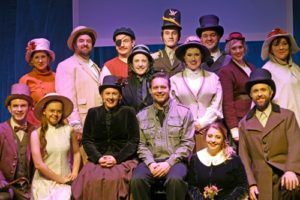 Based on opening night attendance, some performances could be sold out. Please plan accordingly.